You may have seen a meteor shower, but you’ve never seen a shower meatier than this. Phil Lord and Chris Miller’s big screen debut, whenceforth they have conjured box office gold from all manner of unlikely properties (a Johnny Depp TV series, Lego). 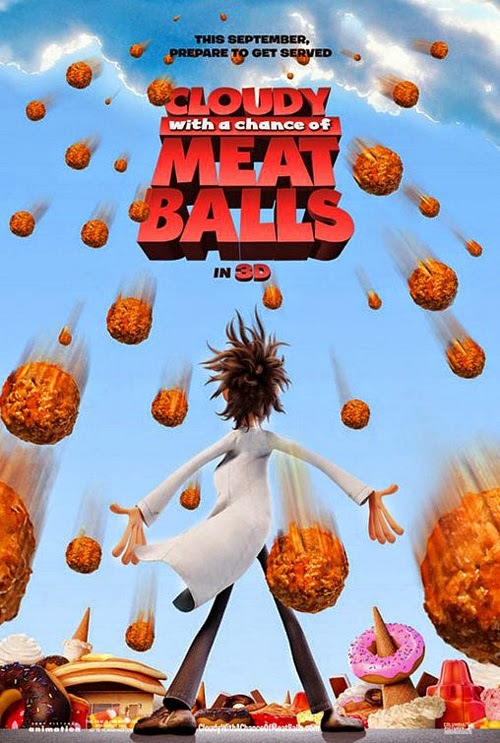 Cloudy with a Chance of Meatballs was a surprise hit for Sony, successful enough to spawn last year’s sequel (and no doubt another beyond that). It’s one that failed to pique my interest. Maybe it was the trying-too-hard title, or the anonymous style of animation. Why, I didn’t even realise Bruce Campbell voiced a character. And… the movie’s… okay. If you’re a fan of CGI cheeseburgers, you probably can’t go far wrong here, but if you want to see an animated feature with mouth-watering food, stick to Ratatouille. Lord and Miller adapted Judi and Ron Barrett’s children’s book (first published in 1978; it’s really old, kids – ancient!) in which raining food is not the result of genius boy scientist’s dabbling and does not solely constitute junk food. And when said comestible deluges become uncontrollable they have to move to a more customary precipitationary environment. There’s a moral in there, I think, since the townsfolk must discover how to obtain food in the usual way. Not having read the book, I presume the usual way is the tried and tested capitalist route – so most of their needs are met by cheap labour in third world countries – rather than grown locally, in gardens, allotments, or surrounding farmland. In the movie version, the one everyone will remember from now on, inventor Flint Lockwood (Bill Hader) is responsible for the fast-food flurries. His mono-browed, with matching moustache, widowed father (James Caan) wants him to join the business (selling sardines), and his constant companion is a monkey called Steve (Neil Patrick Harris). Flint’s reputation for failed and problematic creations precedes him, so when he conjures up food on tap it’s an enormous surprise and one the mayor (Campbell) gets fully behind. Just to make sure all the necessary boxes are ticked, there’s TV weather girl Sam (Anna Faris), who used to be a nerd and of whom were informed reverting to type (cosmetically) is a good thing (well, it gets the science nerd hot under the collar); “This is the real you”. Actually, isn’t it just Flint’s idea of the real her? That’s right, allow others to tell you who the real you is; it amounts to about the same as peer pressure conform to some beauty myth. At least Lord and Miller are intent on giving kids conflicting messages; way to really mess with their heads. Flint grows up convinced he is different and that he has something unique to offer the world, a contrast to the resolutely un-special Emmett in The Lego Movie. There are vague rumblings of economic commentary in here, but it is unclear to what end. When the local cannery closes, the townsfolk must subsist off sardines; Flint’s invention is a result of his attempts to aid the populace in their plight, but gets out of control. There’s a “perils of science unleashed” theme in here, except that it is only the greed of the locals for more and more that causes the mutations that blight their prosperity (so science unshackled from the constraints of market forces will be wholly beneficial?) Alternatively, one might see the rain of junk food as a metaphor for homogenous branded outlets destroying local communities’ identities and self-sufficiency; they provide a quick fix until it is realised there’s nothing left. Which means Flint is the big corporations (the science nerd made good), apparently serving our needs but actually massaging his own ego and bank balance. The ever-expanding mayor, the politician pressing after votes rather than a better life for his constituents, is the incarnation of greed and profit itself. Yet there isn’t anything really daring or intriguing or surprising about this movie. Nothing more than a lesson kids are told anyway; junk food is bad for you (I’m not sure that “Sardines are super gross” is entirely fair, however; I’ve always rather liked them). Free junk food is bad also. Just like junk food you have to pay for. It makes you fat. There might have been room for a The Man in the White Suit lesson in the perversity of a profit-based system, where the invention of something that removes the need for labour and toil (and jobs) is rebelled against, because it undermines the familiar system (Tesla; see below). What if Flint had created unlimited supplies of nourishing food instead? How would the cartoon corporations react to the promise of free food for all, an end to starvation? Nah, it’s just a kid’s film. The asides the directors and their animators throw in are more engaging than the plot itself. Posters on Flint’s wall depict Alexander Graham Bell and Nikola Tesla (Hollywood has come round to bigging up the latter, but what chance of shedding a light on his less accepted ideas; not much, I suspect, although Flint’s lab is modelled on Wardenclyffe Tower, site of Tesla’s curtailed experiments with wireless electricity transmission). The only requirements for a weather girl are to be cute and “super perky”. A sardine, breaking free of Sardine Land, shouts for joy only to be carried off by a passing seagull. A cello made of jello. “I need a celery. Stat.” There’s also the occasional full-on portion of weirdness (for a movie with giant food stuffs plummeting from the heavens, the picture surprising lacks any real spark or distinctiveness); Flint and his pals are surrounded by a platoon of plucked, headless chickens, straight out of a David Lynch film. Gummi bear “gremlins” cause havoc on the wing of a plane. However, the third act action food storm spectacle, as Flint attempts to save the day (to right the mess he made, essentially), is little more than a de rigueur series of CGI toonery action set pieces. Lord and Miller are funny guys with an untarnished Midas touch. I particularly look forward to seeing what they do with one of my ‘80s TV favourites, The Greatest American Hero (how to fill the gap of the unassailable Robert Culp, that’s the big challenge). They took on Cloudy after it had been in development for several years at Sony, and delivered something watchable and occasionally witty, but it lacking the style and personality of the best animation fare. That slickness is evident in The Lego Movie too; the appeals to the heart or delivery of moral lessons (they really just wanted to make a disaster movie here) are prescribed within the family movie formula, rather than elements they have nurtured and care about.